Apply acrylic paint to gelli plate, use brayer to spread paint over entire plate. Press one of the Textured Acrylic Sheets into the wet paint, remove. Press all or a portion of your paper on to the gelli plate and smooth with your hand to create the print. Remove your paper, use another piece of paper is pick up any excess ink. You can see a great video, created by Gelli Arts, on using the new 4" and 6" round Gelli Plates here. Once I completed my 8.5x11" gelli print, shown below, I cut the paper into 2x2" and 1x1" squares. Using the 1x1" squares, I created a card, shown at the top of today's post. I simply layered the 1" squares onto 1 1/8" black squares and then adhered them onto a piece of white, embossed cardstock. I'm giddy over how the colors pop against the stark white! If you've made it this far...hang on for this week's special and product links. For one week only, purchase the 6" round Gelli Plate, Dina Wakley Primitive Icons, and/or Tim Holtz Mesh Texture Fade for a 25% discount! Use code GELLI when checking out! Looks great Kim and I feel your pain in the video. I agree..those colors pop against the white! Very cool card and book! 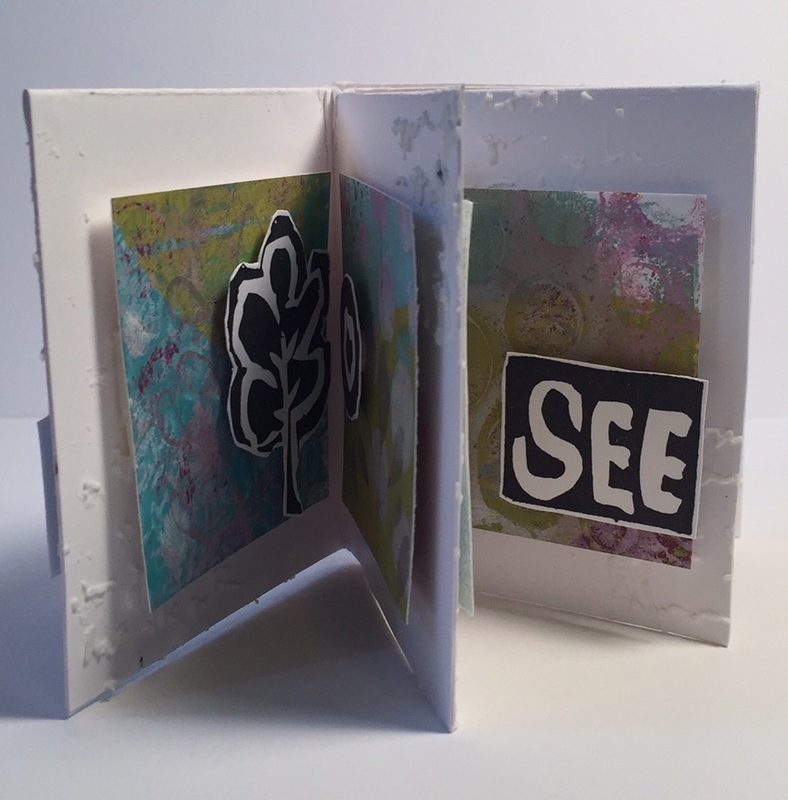 Can't wait to see your video, in the mean time thanks for the link to the video on gelli printing and the mini book. Your colors and textures are fun and look great with the primitive icon stamps. I don't know who wouldn't love getting one of these adorable mini books. 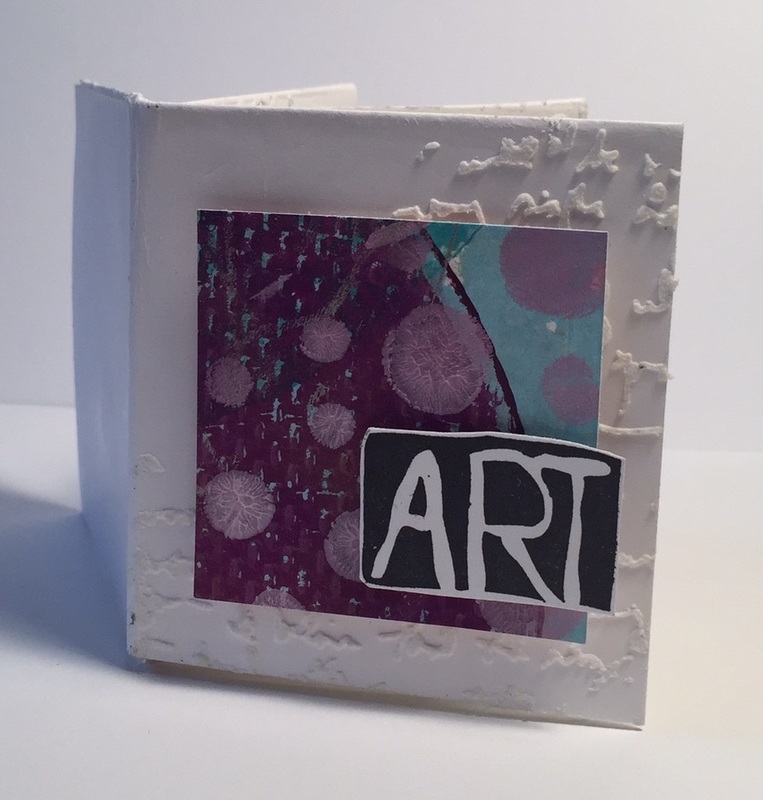 Lovely card book with Gelli printing, Kim !